I would like to thank my neighbor Cliff for sending me the following article. I have been a Central Texas gardener for 26 years and a Landscape Design business owner for quite a while as well, and aside from my biggest concern, which is the over use and mis-use of chemicals, our lack of education and true appreciation for our trees, is a close second. Please read the following article (edited for content), then read the continued information from me about our local Central Texas trees. off of it. The tree was ruined. remains a contentious practice among tree care service companies, despite disapproval from the two leading industry groups. mediation procedure if consumer complaints warrant it, in which their accreditation can be revoked. TCIA has more than 2,000 member companies that follow stringent safety and performance standards. The International Society of Arboriculture also rebukes topping. Created in 1924, ISA is the only organization that certifies individual arborists worldwide. Topping destroys the balance between the roots and crown of a tree. Removing too many branches and leaves can starve trees because without foliage, trees cannot make enough food to maintain their strength. “A tree knows what it needs to produce the amount of food for it to survive,” says ISA-certified arborist,Mark Wisniewski of San Diego. — that are weak and prone to breaking, resulting in a more hazardous tree. In addition, bark tissues suddenly exposed to full sun may be burned and develop disease cankers. Large stubs left behind from improper cuts can’t heal or seal, inviting decay to enter and spread.Fruit trees are an exception. Wisniewski says topping is the most expensive form of pruning. water, it increases their stress level, making them more susceptible to disease and insects.” If larger cuts are required, the tree may not be able to compartmentalize the wound. Sometimes the best option is to remove the tree and replace it with one that is more appropriate for the site. Get professional advice before planting a tree so they’ll have help choosing what works best for their landscape. “Trees are one of the most important assets in our landscape,” says Pittsburgh member Cindi Lacy. I found this article profound for a number of reasons, one…I have been saying this for 20 years and it is just as relevant today. Two, I am shocked that “so called” professionals commit such crimes of nature and sleep at night, and third, that people are left making such an important decisions based on the trust of these “professionals”. Now many like myself, are professionals with educations who are experienced and are not afraid to tell the home owner no. A good part of doing my job well is to be able to tell the home owner what they do not want to hear. The news is not always good, sometimes the tree that was used, really was the wrong tree for the job, other times the tree has been so badly damaged by having been pruned improperly, you are better off replacing it. 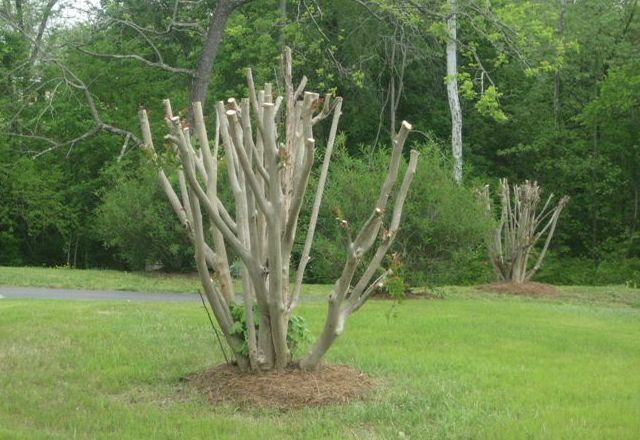 For our local trees, you should NEVER top off your Crepe Myrtles. They should only be trimmed back to pencil thin branches, anything else creates a “knuckle” effect and structurally damages the tree as well as making it aesthetically unpleasing. If you have Oaks, please read my article on Oak Wilt. Oak Wilt is epidemic in Central Texas and you need to know what to do to protect your Oaks. Fruit trees can be trimmed after they fruit until the early Winter months to prevent you from cutting off fruit already set for the following year. be mindful that Winter pruning of fruit trees removes the fruit buds for Spring on the stems that are cut. The main reason for trimming fruit is to keep space in between the branches (for air circulation), you want to trim the ones rubbing together, or any damaged or dying branches. Another important point in this article is that our Texas heat will scorch a tree that is pruned severely in the Summer time. If you are pruning your trees due to storm or wind break, do the minimum you can in the Summer, then complete the job during cooler months not to cut off too much foliage that is needed for food and protection from the Sun. Finally, if you are making new tree choices, contact a professional like myself to help you make the right choices, just because you saw a tree in your neighbor’s yard that was 10 ft tall and lovely, doesn’t mean that is the tree for you. You may not realize that in 5 years that tree will triple in height, or is prone to disease or worse yet, IS NOT NATIVE>>>AHHHH. Feel free to contact me at lisalapaso@yahoo.com with any Central Texas questions. I am always happy to answer what I can. If you would like to schedule a consultation or design apt, I charge $75.00 for a one hour consult. Money well spent when you consider what you waste on mistakes.